Let me begin by saying that Delphinus is an advanced constellation. If you’re still puzzling out Gemini and Orion, you’ll struggle to find Delphinus. It isn’t very bright, and it is extremely small. But looking at this beautiful constellation makes my heart soar every time. Delphinus is a delicate, perfectly rendered dolphin in the sky. According to myth, Delphinus was Poseidon’s messenger. Poseidon was seeking a beautiful nymph named Amphitrite to be his wife. Amphitrite was reluctant, so Poseidon sent Delphinus to convince her to marry the god. Of course, the beautiful dolphin was successful in his quest and was placed in the heavens for his efforts. To most people, Delphinus is a minor constellation. With the city sky glow, it can’t really be seen at all, but on a good dark night you can pick it out near Cygnus. So find Cygnus, which lies right in the Milky Way. You can easily see Vega, the bright star on Cygnus’s left (meaning if Cygnus were flying, it would be in front of the swan’s left wing). Exactly opposite Vega on the right side of Cygnus is Delphinus the dolphin. The stars are very dim, but the brightness is pretty consistent among them. Delphinus is located near Aquila as well. 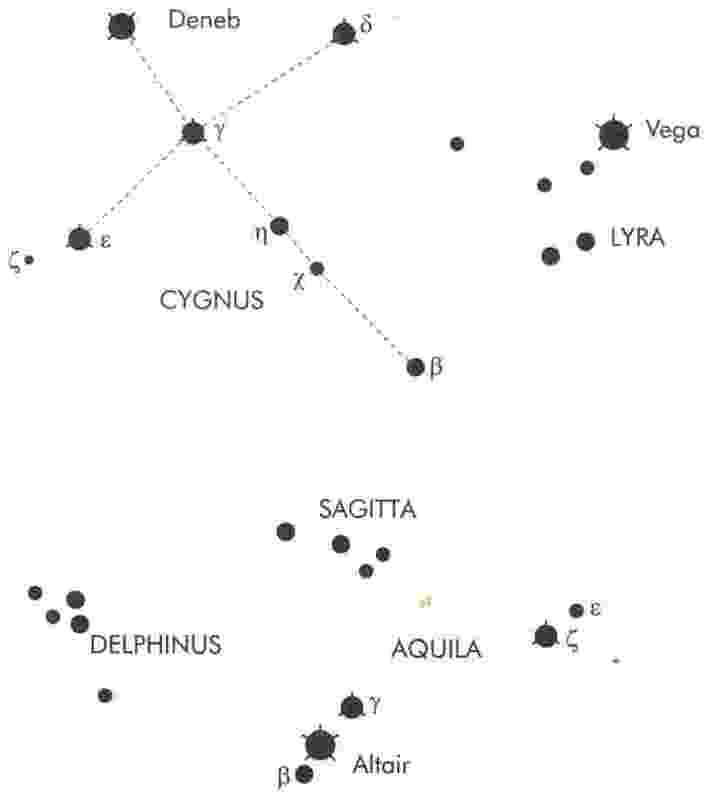 To find Delphinus, locate Aquila the Eagle. 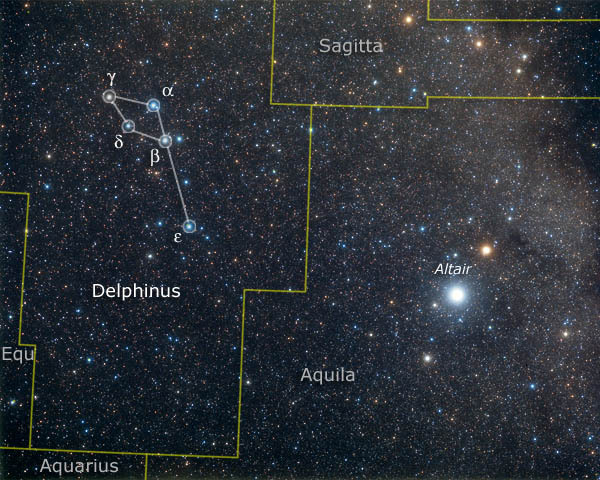 Then follow Altair parallel to Cygnus and you’ll see Delphinus. I love this constellation because it, along with Scorpius, the Big Dipper, and Leo, actually looks like what it is supposed to– a tiny dolphin leaping through the heavens. I also feel like I know a secret. 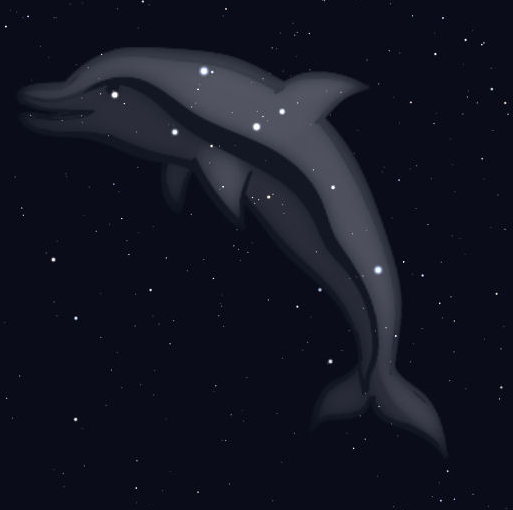 A lot of sky-savvy people know Cassiopeia, Pegasus, and Sagitarrius, but Delphinus is not very well known. If you can master this constellation, you’ll know a secret, too.